This dish was one of my husband’s favorites growing up. It is one of my easy go to meals. It comes together in less than a half and hour and it is full of delicious flavor. I mean anything that has Dr. Pepper in it has to be delicious, right? Melt the butter in a frying pan. Add the chicken to the butter and lightly brown the chicken on all sides. Pour in the entire bottle of BBQ sauce, coating the chicken evenly. Add the Dr. Pepper to the sauce and cover. Cook on medium heat for 10-12 minutes or until you chicken is cooked through. One of our favorite things to serve with this chicken is crispy butter potatoes. They are one of my favorite things, sometimes late at night I just cook some up for a snack. Yum! Melt the butter in a large pan until frothy. Add the potatoes. Stir in all of the spices, adding more or less to your personal tastes. Keep over medium heat, stirring occasionally until the potatoes start to fall apart around the edges, about five minutes. I like to cook them until they are a little crispy. What is one of your favorite childhood meals? This looks so good! I love chicken and trying new recipes. I bet this is tasty! This sounds like the way I make my BBQ chicken, but I've never added Dr Pepper! I have hard great things about it, though! What a nice twist!! I'm going to try this the next time I cook BBQ chicken!!! wow this looks awesome! I love chicken. I love BBQ. and I love Dr. Pepper = win win! We are a huge fan of Dr. Pepper. The chicken looks so tasty. I can't wait to try your recipe. Yummy! This looks so good! I love chicken recipes! Yum! sounds delicious. I've done a similar recipe with coke in a crockpot…but I like how much faster yours is to make! This looks so good! My family has been eating a lot of chicken lately and we need new ideas. This chicken is so incredibly easy! I'm pretty sure I have all of the ingredients, to be able to try it tonight! Ooooo this chicken sounds delicious!!! I'm always looking for new chicken recipes. Will have to try this! 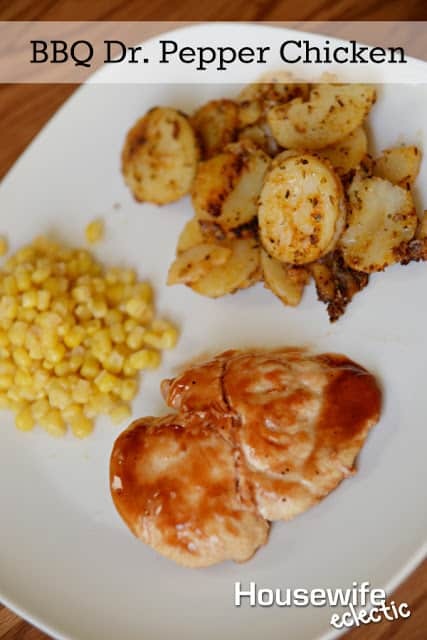 I'm not a big fan of BBQ sauce, but using Dr Pepper to cook chicken really intrigues me. We're big chicken eaters in this household. As a child, I remember eating "elbows and meat sauce." This chicken looks so yummy!!!! Anything cooked in butter could not be anything but fantastic!! Looks so tasty! Also love how easy it is to make – my kind of meal! Found you on the SOS party!